As soon as you play your first songs, you should try to give them your personal note. 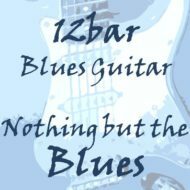 Although it is good to listen to many different artists and to learn new playing techniques from other players, you need to find your own place in the Blues. No one needs another Eric, Stevie or Muddy. They all have found their characteristic tone. You need only a few notes to identify EC or Santana, even if both play the same song. Listen to “From The Cradle” – EC has studied the originals very well, used the same tunings, key and techniques but you can still hear it’s EC playing. There are many ways to personalize your art of playing. Le’s take the “three Kings of Blues” – B.B., Albert and Freddie King (they are no relatives!). B.B. is well known for his fluid, melodic Chicago style phrasing mixing major and minor scales. He plays with a pick and has a very characteristic wrist vibrato (“hummingbird”). Albert played different. Using his bare thumb and extreme bends, his sound was rough and used less notes to tell something. And Freddie used thumb and finger picks, playing a really powerful, often aggressive Rock/Chicago/Texas mixture of Blues. The notes/scales. If you like jazz, try to combine the Blues with some jazzy scales, if you like Rock music, include more power chords. Try double stops, arpeggios, picking patterns. The picking hand. Try a pick, try fingerstyle, try fingerpicks. I found my way with fingerstyle, while others miss the ability to play faster or use palm muting. The playing techniques. Slide guitar is great if you don’t like to play fast. Bends, vibrato – there are many things to personalize. Your gear. B.B. King’s ES-335 (Lucille) tone is another reason to identify his playing. Try acoustics, electric with single coil or humbucker pickups. Try transistor and tube amps. Don’t waste your time with “How do I get exactly EC’s tone from Live at Hyde Park?”. Think of “If I were in his band during that concert, what would have been a good equipment for me?” instead. Many EC fans appreciate George Terry’s playing with EC during the 70’s, but a more different sound compared to EC would have been nice. But always consider: you must feel comfortable with it, whatever you do. People will hear that!